Anthony (“Tony”) Kariotis, 95, passed away January 18, 2019, following a lengthy illness. Born in Vandergrift, PA, he had lived in Tallmadge since 1956.Anthony served in the Army Air Corps during WWII. He enlisted as an Aviation Cadet in 1943 and graduated from Ellington Field, Texas, Army Air Force base as a Celestial Navigator. He received his wings commission as a 2nd Lieutenant and was assigned to the 1504th Army Corp, Pacific Division ATC. Anthony was discharged as a 1st Lieutenant in 1946, after serving in Europe and the South Pacific, and received the WWII American Campaign and Asiatic Pacific Medals. He received his mechanical engineering degree from Youngstown College, and retired in 1986 after 31 years as an aerospace engineer with Goodyear Aerospace. 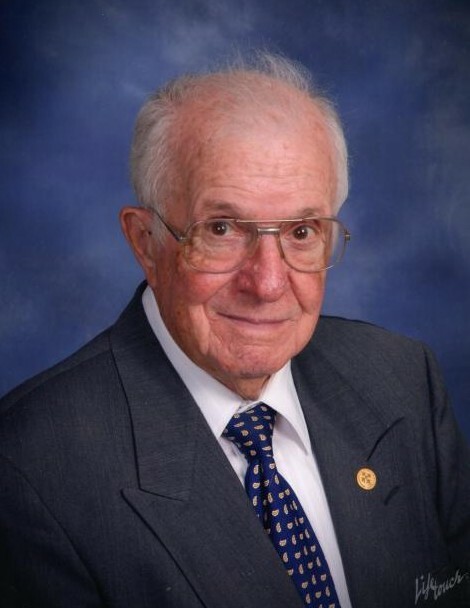 He was an active member of Annunciation Greek Orthodox Church in Akron, where he served as President, and for many years on the Board of Trustees, and was a founding member of the male chorus. He was also a member of the Tallmadge Democratic Club, VFW, and Order of AHEPA where he served as President and District Governor. Tony was a loving husband, father and “Pappou”, and took special pride in his Greek-American heritage. He enjoyed time with his family and many dear friends, golfing and playing bridge, and was known for spontaneous song. He was preceded in death by his wife of 66 years, Angelin; parents, Harry and Katherine. Anthony is survived by son, Bob (Patricia) Kariotis of Lower Burrell, PA; daughter, Kathryn (James) Vanderwist of Solon; sister Patricia Tranto of Boardman, OH; grandchildren, Andrew, Anthony and Peter Kariotis, Michelle Robertson, and Timothy and Bobby Vanderwist; and five great grandchildren, Brittany, Nicholas, Connor, Miley and Leila. Calling hours will be 4:00 until 7:00 p.m. Wednesday, January 23, 2019 at the Donovan Funeral Home, 17 Southwest Ave. (On the Historic Tallmadge Circle) with Trisagion Service at 5:00 p.m. and AHEPA service to follow. Funeral service will be held 10:00 a.m. Thursday, January 24, 2019 at Annunciation Greek Orthodox Church, 129 S. Union St., Akron, OH 44304 with Fr. Jerry Hall officiating. Interment will be at Mt. Peace Cemetery. In lieu of flowers, memorials may be made to AHEPA Chapter #63 Scholarship Fund (c/o Robert Kilivris, Treas., 482 St. Andrew Dr., Akron, OH 44303), or to Annunciation Greek Orthodox Church Building Fund, 129 S. Union St., Akron, OH 44304.